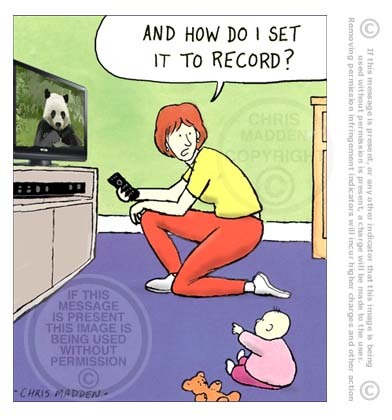 Cartoon showing the Facebook logo as the head of an elephant watching and recording the activities of its users. 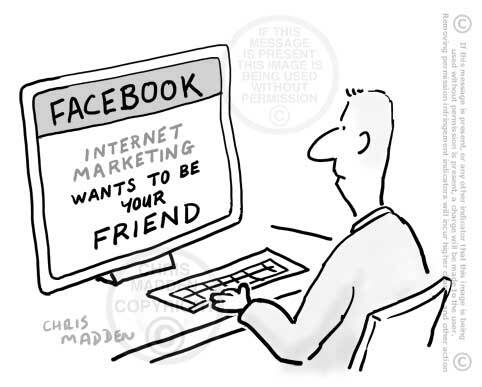 The cartoon is meant to link Facebook with Big Brother in George Orwell’s book 1984. It is about surveillance of the internet by organisations and government, internet users’ surrendering of privacy, net privacy, a potentially distopian future. 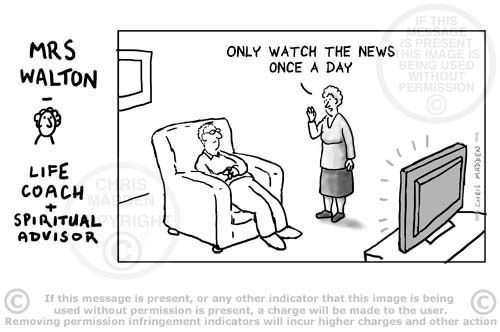 A cartoon comparing Facebook with George Orwell’s Big Brother in 1984. The price of Facebook shares has fallen since the company was floated on the stock exchange recently. The cartoon shows the famous Blue Peter badge with the sailing ship on the badge sinking. Facebook cartoon/illustration. Facebook as Big Brother – Facebook is watching you! Illustration depicting Facebook’s logo as part of a face with the caption “Facebook is watching you”. The face is meant to evoke the concept of Big Brother, from George Orwell’s 1984 (especially because of the eyes). The caption is based on the 1984 slogan “Big Brother is watching you”. The idea for the image was inspired by an article in the New York Times, reprinted in the Observer on 12th Feb 2012: Taking a Stand to Protect Privacy by Somini Sengupta. According to the article, Facebook monitors and retains vast amounts of information about Facebook users, including deleted posts and messages, and also stores information about the user’s physical location. Such information helps Facebook and other companies target advertising on individuals. As Facebook and similar organisations become bigger and more powerful the implications of their use of user data become more and more worrying. Facebook, Google and other internet megacompanies could easily take on a Big Brother type role. At the moment the use of user data is probably concentrated in marketing and market related spheres, however there is no reason why such data couldn’t be used in future by repressive governments or other repressive controlling organisations. Illustration depicting Facebook’s policy of storing data about Facebook users. Graphic incorporating the Facebook logo as the trunk of an elephant, with the caption “Facebook never forgets”, based on the saying “An elephant never forgets”. The cartoon was inspired by an article in the New York Times, reprinted in the Observer on 12th Feb 2012: Taking a Stand to Protect Privacy by Somini Sengupta. According to the article, Facebook retains vast amounts of information about Facebook users, including deleted posts and messages, and also stores information about the user’s physical location. Such information helps Facebook and other companies target advertising on individuals. Cartoon in a style that’s similar to a David Shrigley drawing. Artwork designed specifically to appear on internet image searches, urging people to stop using the internet so much and to get out a bit. Vaguely in the style of a David Shrigley drawing. The cartoon urges viewers to “Get off the internet and get a life”. This image is in a style similar to David Shrigley art. It is drawn specifically for how it will look when it appears in internet image searches such as by using Google image search. So it may appear on image search pages that display artwork by David Shrigley (because Shrigley is mentioned several times in this explanation). 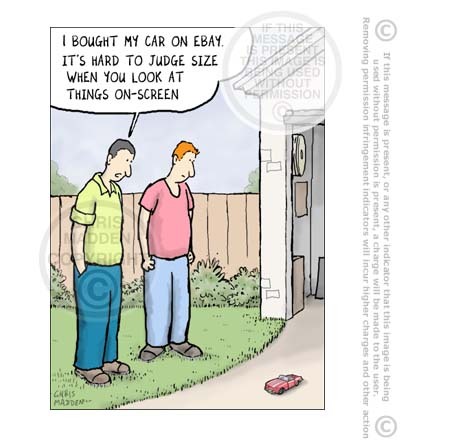 The idea is that the display of images on an image search page is a form of exhibition in an art gallery, and this cartoon is a humorous ‘intervention’ in the exhibition. Because the cartoon was drawn in a style that looks a bit like a piece of David Shrigley art work, and because David Shrigley has a major exhibition of his work, Brain Activity, at the Hayward Gallery at the moment (February 2012) I thought it would be an appropriate time to display the drawing. The artwork, titled – Get off the internet and get a life – is meant to be ironic and humorous, especially as viewers will normally come across it while deep in an internet image search. Is it art or is it a cartoon? Well, to me that’s a falsely framed question, because cartoons are art. At least some of them are (just as some art isn’t art). Text based artwork or cartoon in a style that’s a bit similar to a David Shrigley drawing. Artwork designed specifically to appear on internet image searches. Vaguely in the style of David Shrigley. Because the cartoon was drawn (some time ago) in a style that looks a bit like a piece of David Shrigley art work, and because David Shrigley has a major exhibition of his work, Brain Activity, at the Hayward Gallery at the moment (February 2012) I thought it would be an appropriate time to display the drawing. Cartoon. Kodak Eastman goes out of business. Kodak fades away like an aging print. 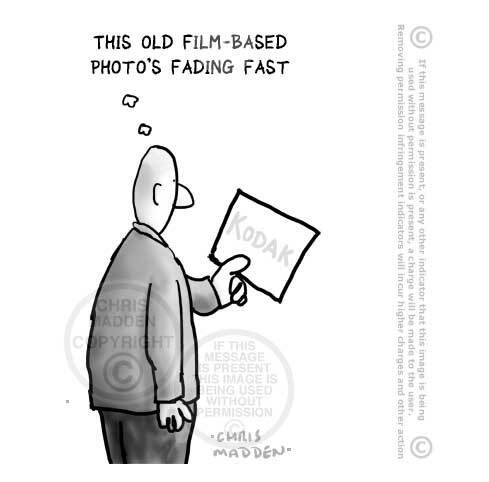 The cartoon shows a person looking at an old photograph that’s fading away. The image on the photograph is the word Kodak. It is a metaphor for the way that the Kodak Eastman company has faded away due to the fact that digital photography has superseded film photography. Cartoon about Hell – Mobile phone gets no signal in Hell. 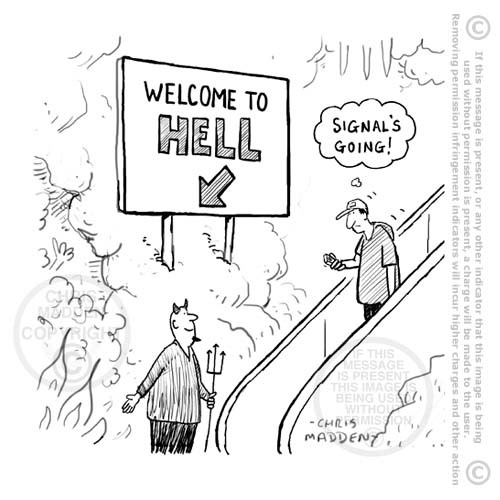 Cartoon about Hell – there is no cell phone signal in Hell (which is one of the reasons why it’s Hell. 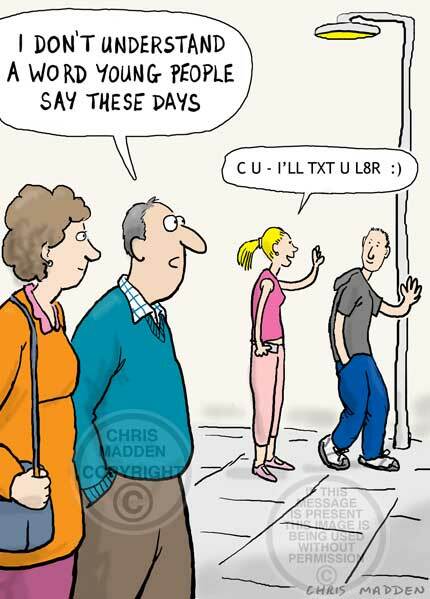 Part of the humour of this joke is that people are so reliant on cell phones or mobile phones that the idea of not being able to get a signal is truly terrifying and hellish. 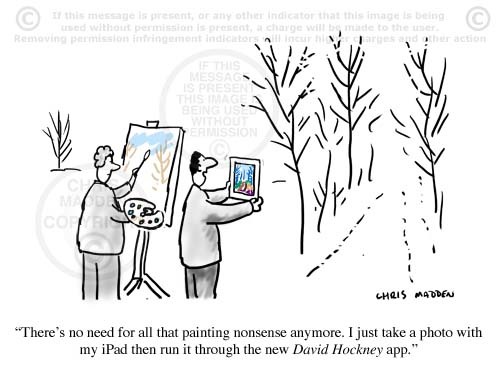 It’s a cartoon about people’s over reliance on modern technology, without which they feel alienated and cast adrift. Cartoons about Hell are a common theme, found everywhere from Gary Larson Far Side cartoons to cautionary depictions in medieval illuminated manuscripts. Cartoon showing a cartoon character saying to another one who’s reading a book, “You can’t learn everything from books, you know. 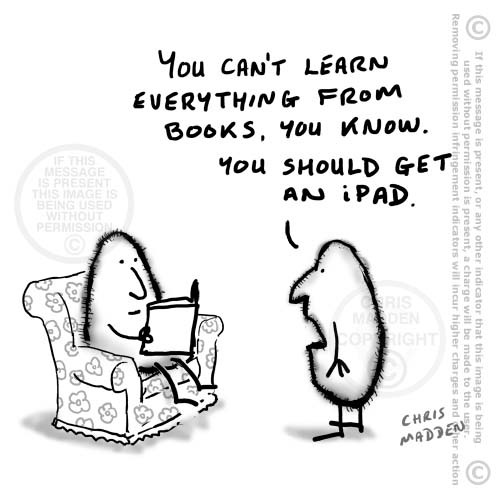 You should get an ipad”. Cartoon character reading a book. Another one saying “You can’t learn everything from books, you know. You should get an ipad”. A cartoon about reading books, reading on iPads, Amazon kindle, reading habits, tablet technology, different reading platforms, books versus iPads. 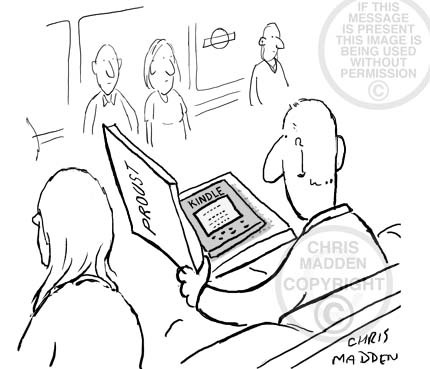 A cartoon showing a person using a computer. The computer has a human head and the user has a computer monitor as a head. 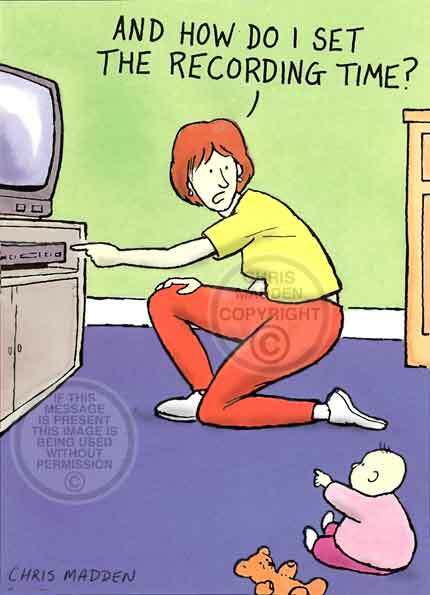 I don’t know what this cartoon means. 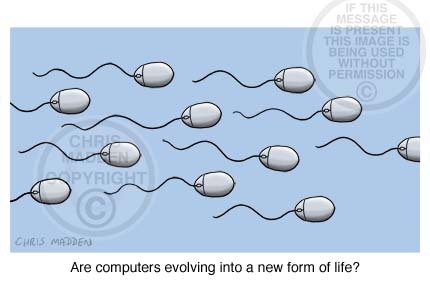 Cartoon related to the Turing test. A cartoon showing a computer monitor and a human head transposed. A traveller on public transport concealing a Kindle inside a book so that other people can see what he’s reading. He’s reading a ‘difficult’ book, so he wants his fellow travelers to know. 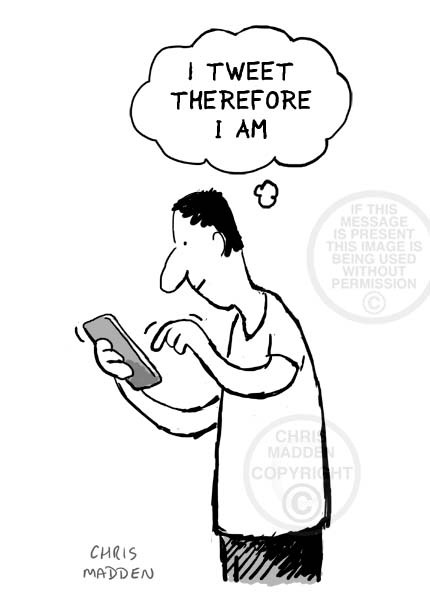 A cartoon showing a man posting a tweet and thinking “I tweet therefore I am”. The quote refers to Rene Descartes saying “Cogito ergo sum” or “I think therefore I am” (or in French “Je pense donc je suis”). A Biblical cartoon showing Moses descending from Mount Sinai with the stone tablets containing the Ten Commandments. Moses pointing out that the text on the tablets rotates to be self-righting when the tablets are turned. 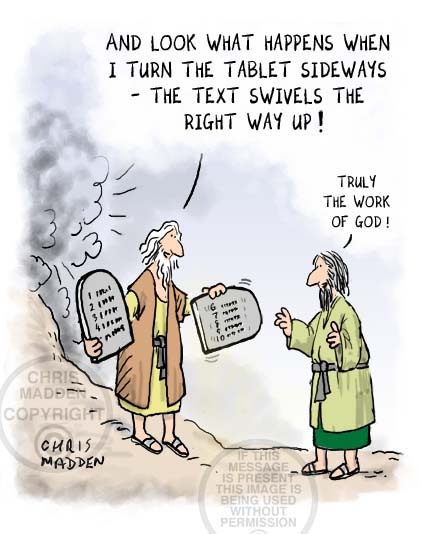 This is even though the tablets are stone tablets and not modern digital tablets such as the iPad. It’s obviously a miracle because it defies the laws of physics. A cartoon about computers, iPads, iPad, digital tablets, miracles, the bible, religion, religious myths, tablets of stone. 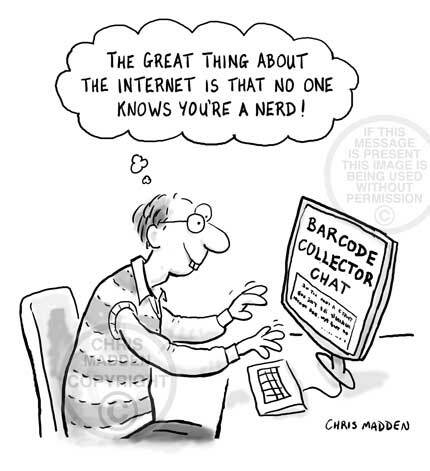 Cartoon: a nerd on the internet thinking that other people on the internet wouldn’t realise that he was a nerd – even though he’s writing posts on a nerdy web forum. Editorial cartoon on the subject of the death of Steve Jobs, co-founder of Apple computers. Jobs quit his role as ceo of Apple several months ago due to ill health. Showing the Apple logo falling from an apple tree, illustrating the death of Steve Jobs and perhaps illustrating Apple’s share price falling as a result (probably in several years’ time).